I’m a long-distance hiker and outdoor travel blogger. I first got into backpacking during college on the Appalachian Trail. Upon graduation, I set out to hike the Appalachian Trail in its entirety from Georgia to Maine. Six months and 2,000 miles later, I completed my goal. 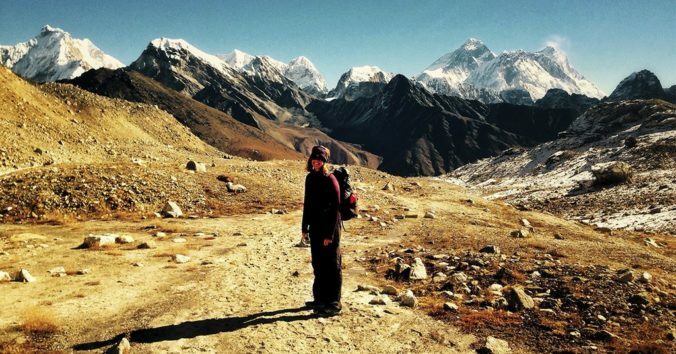 My biggest outdoor endeavor was this past year when myself and a friend hiked the Great Himalaya Trail, an 800-mile walk across Nepal’s Himalaya range. The GH Trail is an up and coming hike that not many people have done. For one thing, it’s difficult to navigate and unmarked. The elevation changes are so drastic, sometimes I walked through sweltering jungles while other times over snowy passes. Everywhere I went, I was greeted by friendly, curious locals willing to give me directions or wanting to look at my tent and backpacking gear. Do research ahead of time. Whether I’m going for a short day-hike around my neighborhood or planning an international trip, I always do adequate research ahead of time. Things I research include weather conditions, what time is sunset, water sources available, and miles I plan on hiking. I also look at regional rules, like if permits are required or if camp fires are banned. For me, this means not trying to hike more miles or gain more elevation than is reasonable. I learned this lesson the hard way while on a 10-day hike in Peru’s Cordillera Huayhuash range. I did not take an adequate amount of time to acclimatize, and I ended up getting acute mountain sickness for the first few days of my trip. Now I make a greater effort to be realistic about what I can accomplish in a day or during a trip. Figure out what is important for your happiness on the trail. The two biggest things for my hiking happiness is food and photography. I’m not a person who can eat plain Ramen noodles and be satisfied. I want dehydrated vegetables and freeze-dried meat in my meals. Photography is one of my favorite aspects of hiking, so I have a cell phone with a good camera and a power bank to charge it. This will help you have a more enjoyable experience and get stoked for your future hikes. The essentials really vary depending on if I’m doing a day hike, a multi-day wilderness hike, or a multi-day guest house trek (such as in Nepal). Basics for a day hike include: adequate water and snacks, sun protection, an extra jacket, and comfortable shoes. For a multi-day hike, this list expands to include: shelter, a sleeping bag, water treatment, cooking supplies, a headlamp, and adequate layers of clothes. For a complete gear list, check out my long distance hiking checklist. New hikers often justify bringing extra gear by thinking, “I better pack this just in case.” I encourage you to leave the “just in case” items at home. Pack all of your gear ahead of time and go for a walk while wearing your backpack. If it feels too heavy walking down your flat street, it’s going to be downright miserable while hiking over mountains. Whether it’s your first time in the mountains or you’re an experienced outdoors-person, follow my hiking tips for a more pleasant experience.